The Dromaeosaurus name actually means "Running Lizard". Many Fossil remains have been found in Alberta, Canada, and Montana, USA but there has never been a full body and head found together. There have been remains such as a head, limb, teeth, ribs, and other various body parts scattered along the dinosaur fossil hotspots of the two regions. It was first discovered by a man named Barnum Brown in 1914 along the Red Deer River. Later on many fossil teeth have been found of the Dromaeosaurus. Scientists could only guess that this dinosaur may have had an attitude to attack other dinosaurs that were much bigger. The Dromaeosaurus was actually the size of a dog from the main finding by Mr. Barnum. The Dromaeosaurus was from the Theropoda group. 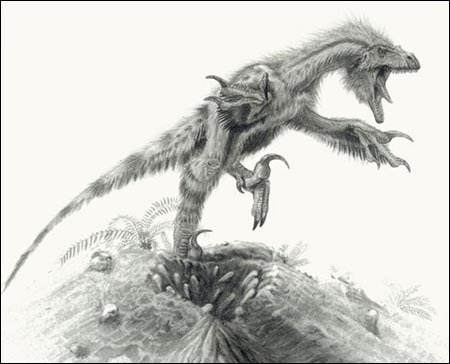 It was thought to be a heavily feathered dinosaur. Dromaeosaurus actually had a lot in common was the Tyrannosaurus, though. It had a very strong build with powerful legs. Not only that but it also had a very thick skull and powerful jaws. Even with the fact that there have not been many fossil findings of this dinosaur it actually is named after its own group "Dromaeosauridae". Those in the same group had much in common and where considered very bird like.